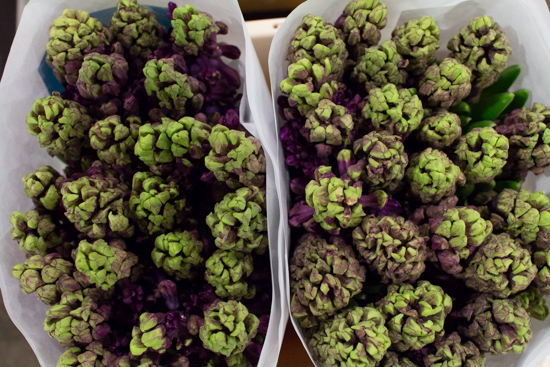 This month, we're going to take a look at hyacinths, which are available both as cut flowers and as potted bulbs. 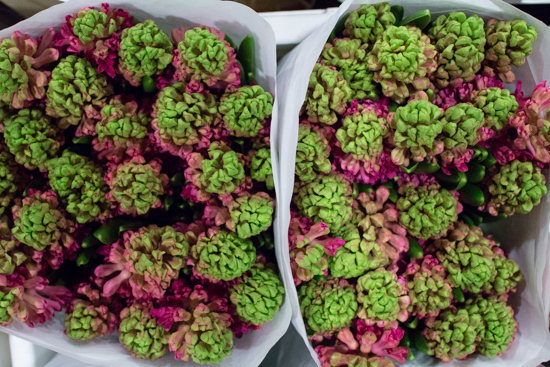 They're in abundance at New Covent Garden Flower Market at the moment and come in a wonderful range of colours. 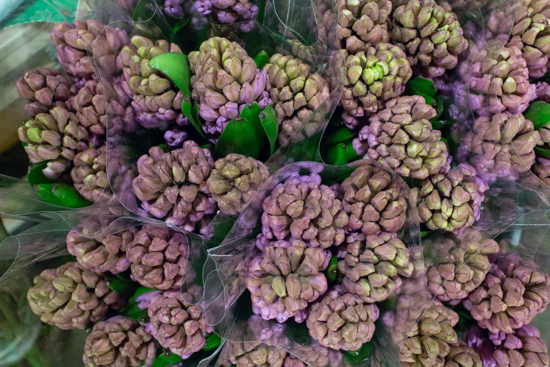 From the Liliaceae family, the hyacinth's Latin name is Hyacinthus orientalis. 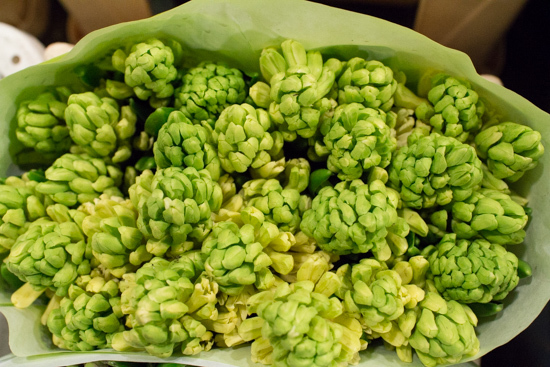 Hyacinthus derives from the Greek name, Hyakinthos. According to the Greek myth, the sun god Apollo fell in love with Prince Hyakinthos. During a discus throwing contest, Hyakinthos was accidently killed by Apollo. And then a hyacinth grew out of Hyakinthos' blood. 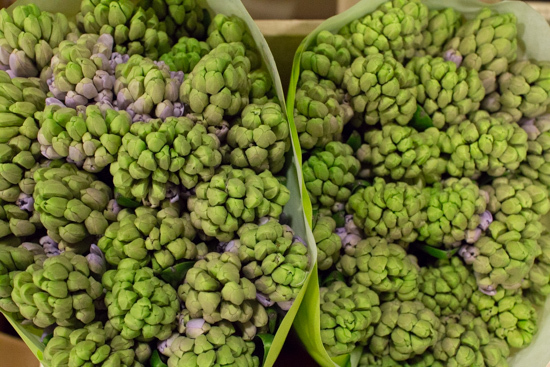 Hyacinths have highly-scented, waxy, bell-shaped florets on a thick fleshy stem. 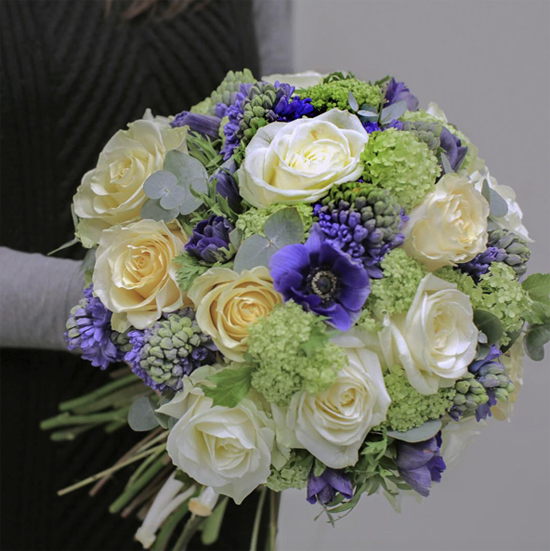 As cut flowers, white and blue are the most popular colours. But they also come in purple, lilac, mauve, magenta, pink, peach and yellow. 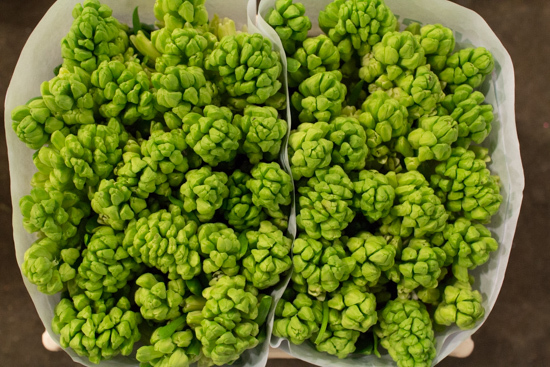 You'll generally find them as a cut flower at the Market from November through to March/April. 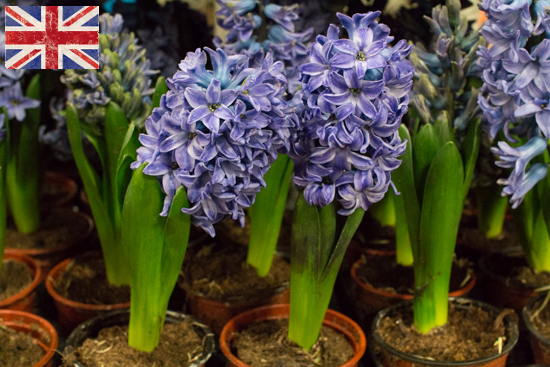 Dutch potted hyacinth bulbs are available from early December through to the beginning of April, whereas you'll usually find British ones from December through to February. 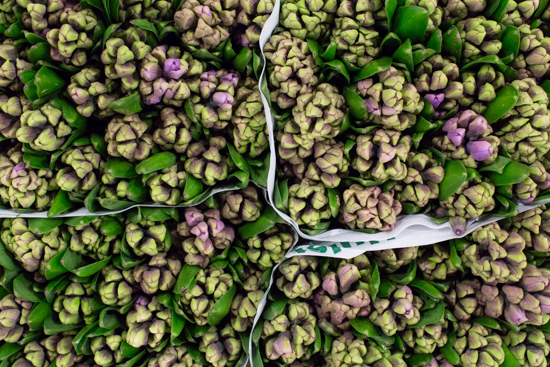 Hyacinths are available in wraps of 25 stems. 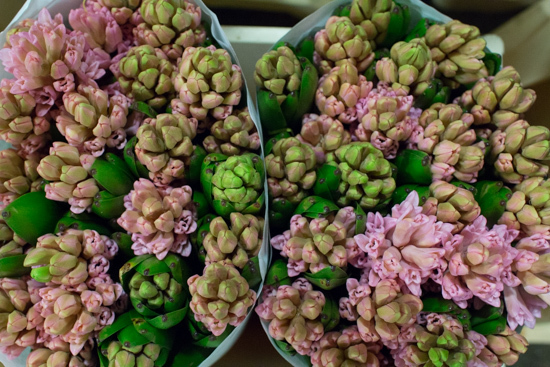 David at DG Wholesale Flowers says: "Hyacinths are the one flower that you never cut. 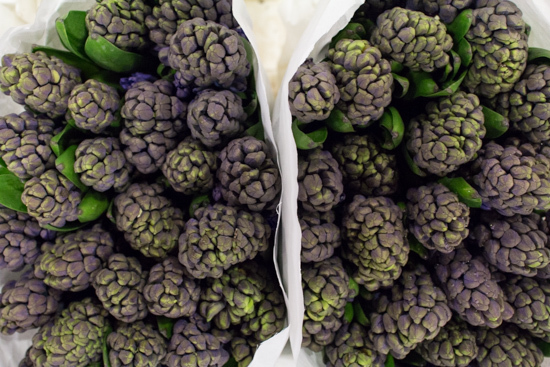 If you look on the outside of the wraps, you'll see illustrations advising you not to cut the bulb base." This is because it's vital to leave it on to help prolong the flower's vase life. 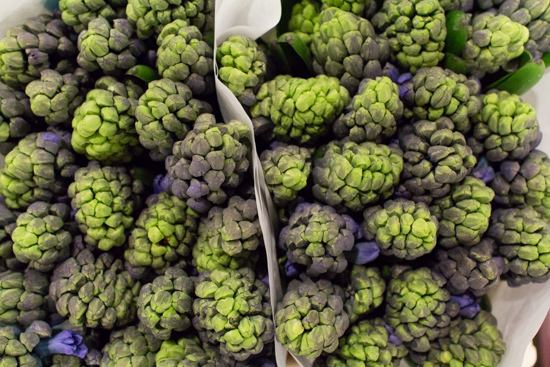 Simply rinse them, if necessary, and place them in fresh water. 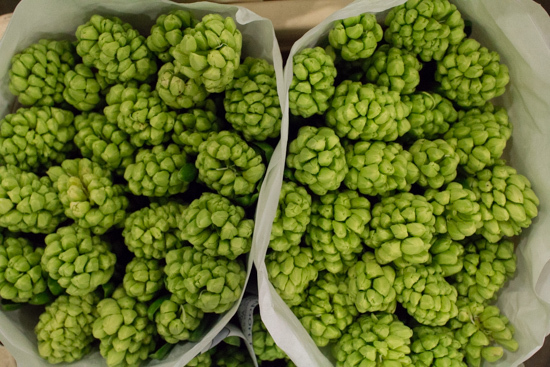 Single bulbs are available in trays of 20 pots. And pots of three bulbs are available in trays of 10. Paul at Evergreen Exterior Services says: "Singles come in blue, white and pink. 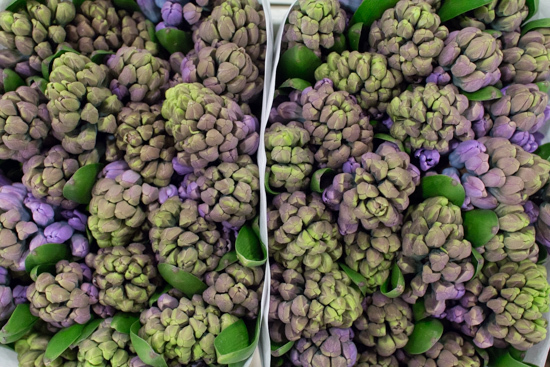 There are also trays of mixed coloured singles in blue, white and pink, plus sometimes purple and magenta. 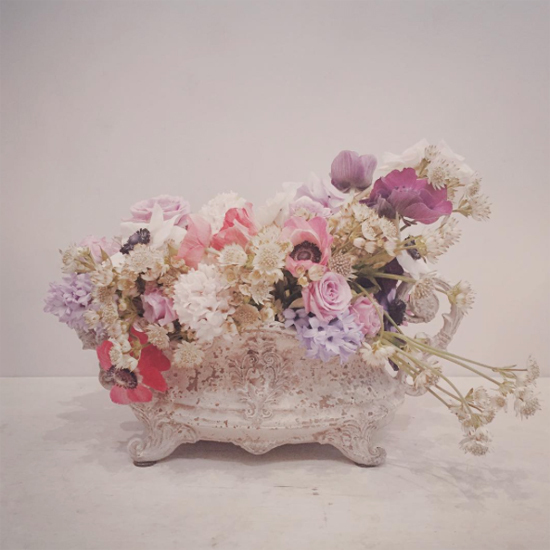 The pots are always the colour of the actual flower. 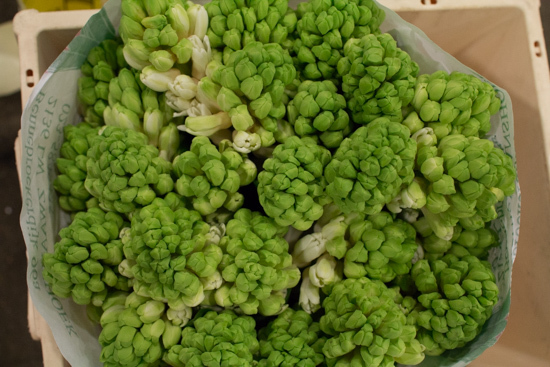 And it's easy to spot white hyacinths as their bulbs are white." 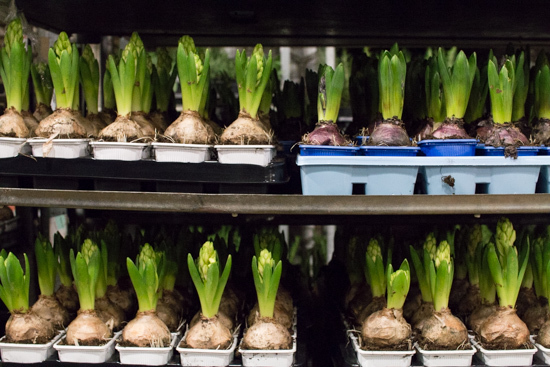 Bob at L. Mills says: "British single bulbs come in trays of 18 pots. And pots of three bulbs are available in trays of 7 pots. 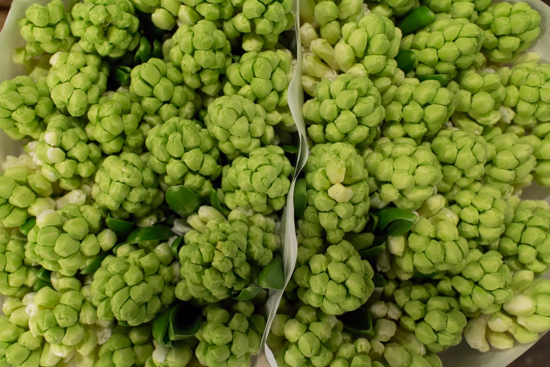 The flower heads of the British potted hyacinths tend to be less uniform in appearance, compared to Dutch. And they're not forced." 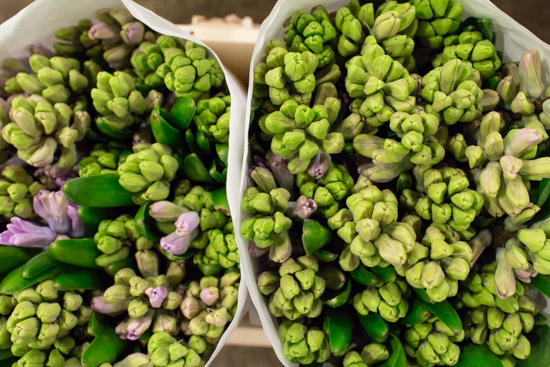 Care-wise, place potted hyacinth bulbs in a cool well-lit place and keep the compost moist. 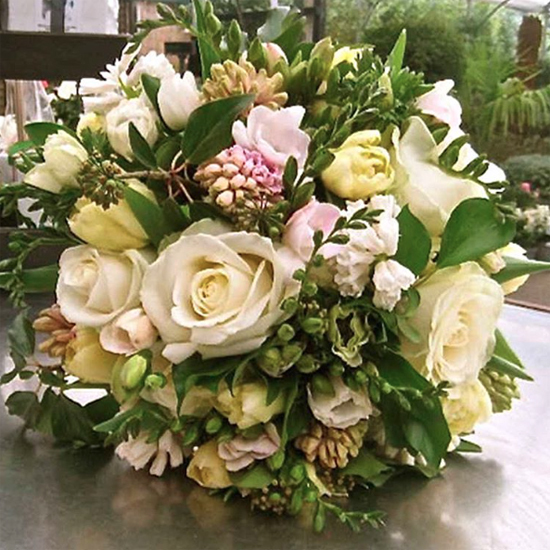 If the flowers become top-heavy, you may like to support them with twigs. Also, if they start leaning towards the light, turn them every now and again. 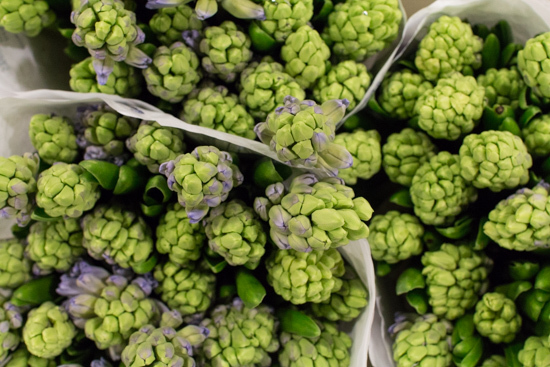 Hyacinths look wonderful in hand-tied bouquets and tablecentres. 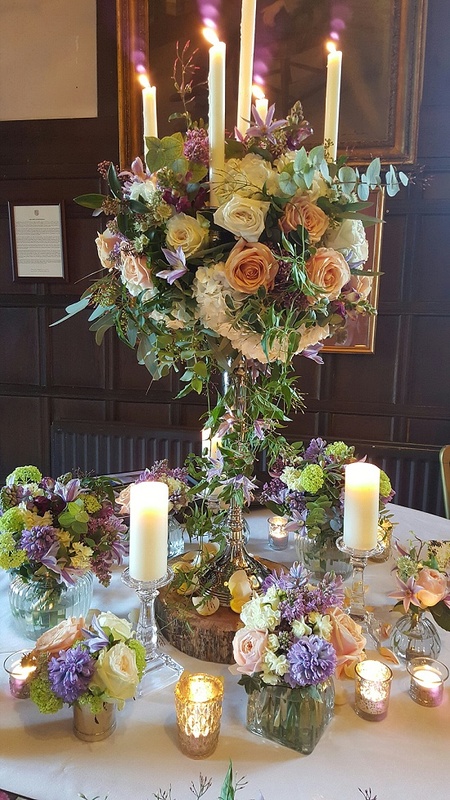 Deconstructed, their pips are ideal for intricate designs such as headdresses, buttonholes, corsages, hair combs and napkin rings. 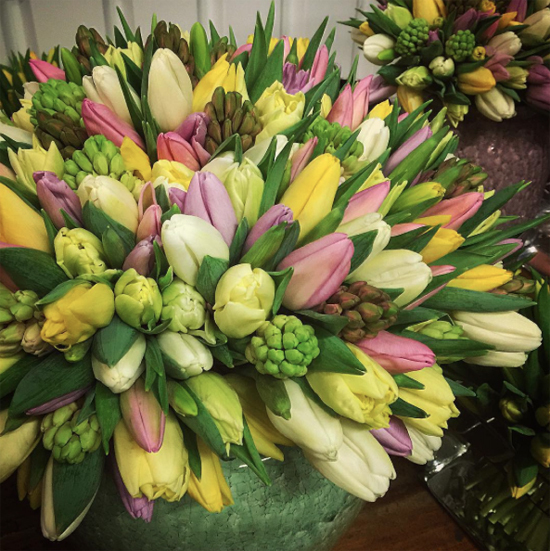 Individual bulbs potted up in containers add a lovely floral touch to tables in bars, restaurants and hotels. 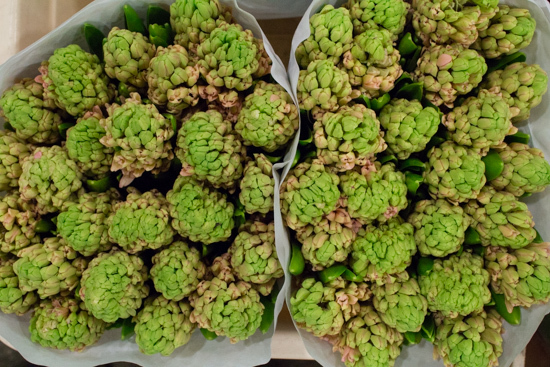 Alternatively, plant them in groups in attractive containers, such as enamel bowls. They're ideal as gifts! 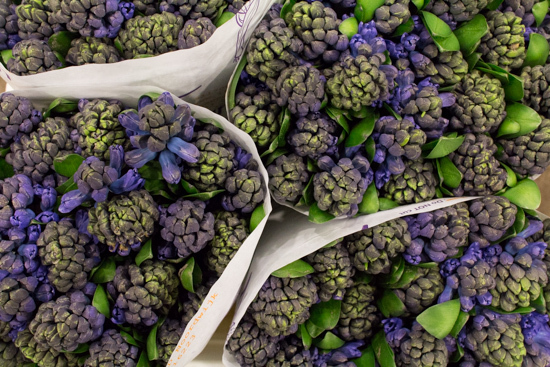 We'd love to see photos of arrangements that you've made using hyacinths from New Covent Garden Flower Market. Simply send an email to info@cgma.co.uk, stating your company name and website address. 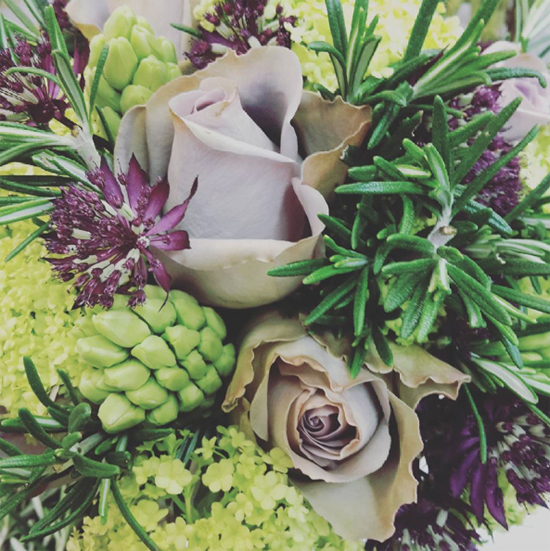 Or if you prefer, you could post your photo on Twitter and copy us in, by including @MarketFlowers in your tweet. We'll then upload your photos into this section. P.S. 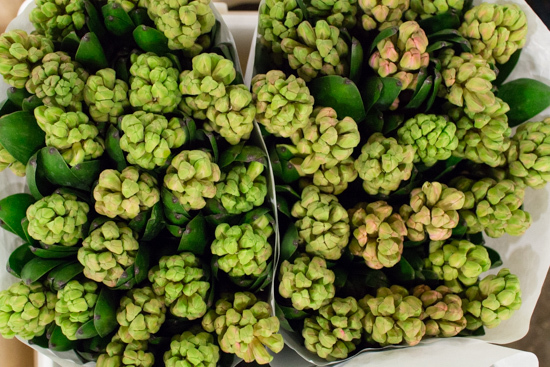 Did you know that hyacinths, especially as potted bulbs, are in great demand towards the end of March in the Middle East and other regions because they form an important part of the celebration of Nowruz?